As of early afternoon on Saturday Harvey was about to be downgraded to a strong tropical storm after slamming into the Texas coast as a Category 4 monster hurricane packing 130 mph sustained winds. Residents along the coast are just now starting to assess the initial damage from this first major blow. However, the big rain event that is Harvey is just now getting started. According to the National Hurricane Center, the storm’s forward speed has now slowed down to about 2 miles per hour in a north-bound direction. Meanwhile, its shield of encircling rains is expanding to cover most of eastern Texas. These rains are very intense — producing accumulations of more than 1 inch per hour in many locations. And with Harvey stalling out, such heavy rains are expected to persist over basically the same region and at a similar high intensity for at least the next four days. After that time, Harvey is expected to persist and rains of lighter, but still flood-producing force, may continue to fall over parts of Texas for up to five more days. It’s worth noting that though up to 15 inches of rain have already fallen from Harvey, the longer range models still show in excess of another 20 inches coming from the storm over the next week. 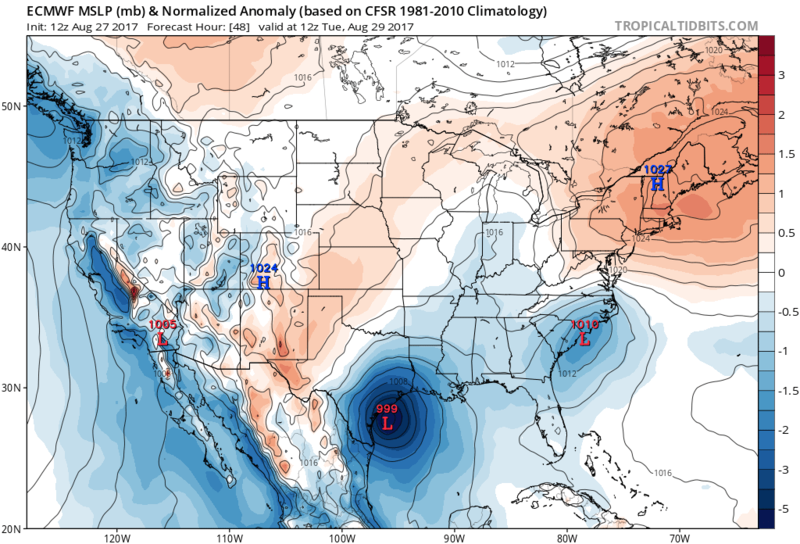 Many models indicate that more than 40 inches of rain could fall in total. And some of our best models yesterday indicated a potential for up to 60 inches in some locations by the time all is said and done. In other words, this storm is far from over. The main event, in which Harvey may ultimately produce historic rainfall totals, is just getting ramped up. So now is not the time to relax our guard. Harvey made ~~~two~~~ landfalls last night, apparently. Meteorologist mentioned it on that Houston CBS live feed earlier today and it’s referenced here, too. Talking about the stall and gradual spindown, right now. So it’s as the storm spins out that its rain shield can greatly expand. Right now, there’s also a very strong moisture flow being drawn into the storm from the Gulf. Especially over Houston. 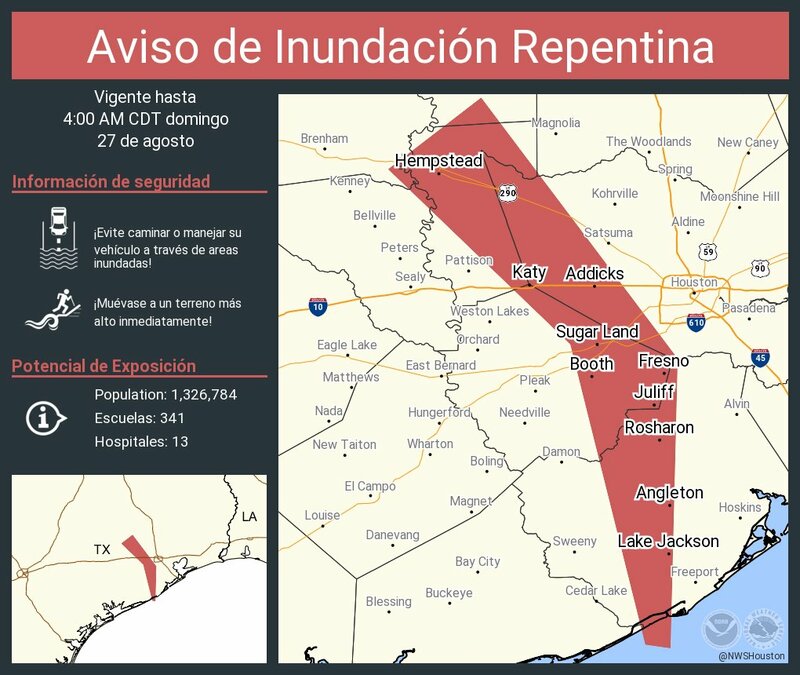 Houston could receive as much as two to three inches (five to seven and a half centimeters) of rain per hour in the upcoming hours due to Tropical Storm Harvey, Mayor Sylvester Turner said on Saturday. Jeff Piotrowski “gets hit with ocean waves as Hurricane Harvey tears into beach front property while he live streams it” yesterday. Gets a bit intense toward the end. Here is his riveting experience going through the eyewall last night. He’s gotten an Emmy for his work, very professional but emotional still. He had some 145-150 mph measurements in Rockport while holed up in a carwash. Any way to take that Harvey swirl and place it elsewhere on a map? I know Texas is a big state, and the hurricane portion covers a quarter of the state…for visceral effect, I’d like to be able to put that over Maryland, or New Hampshire, or Wyoming, states I’m more familiar with. Just posted the 245 PM EST radar update from the National Weather Service. That rain shield is still growing. 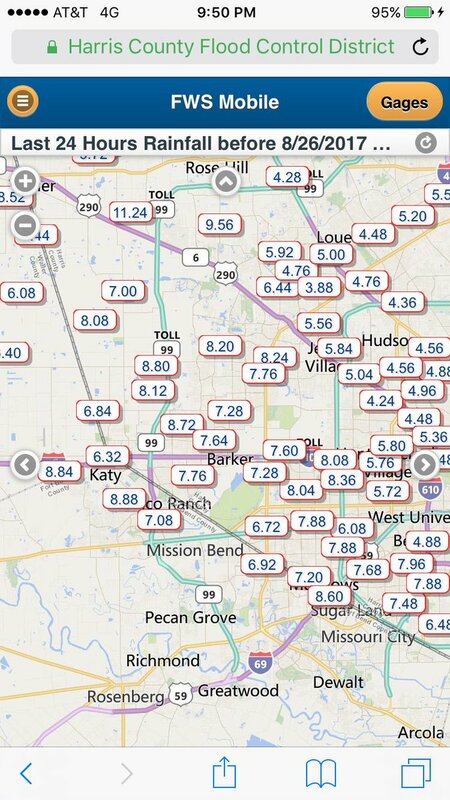 Eastern Houston has been getting pounded for about 6 hours now. 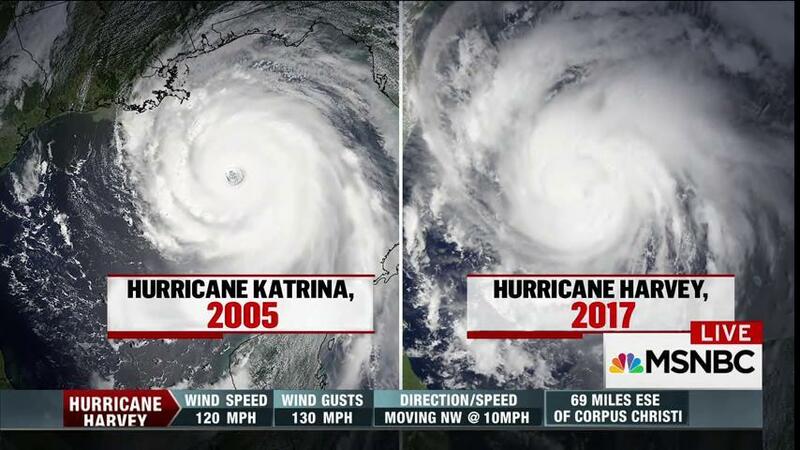 Katrina and Harvey, side by side. Harvey was Cat 3 at the time of that image collection. South and East Asia are in that powerful tropical moisture flow. India, Bangladesh and Nepal on tap for more severe rain that they definitely don’t need. Bangladesh already experiencing worst flood in 100 years. Could still worsen overall. Crikey! Can you imagine how readily a mountainous country like Nepal gets flood torrents? Almost the same path, potentially, as Hato. Looks like things got pretty ripped up down there. Much worse than what’s evident in that vid. Drone on this one covered a lot of area, coming in for some fairly close-up closeups. Compare and contrast with 2010’s Alex. Someone in Rockport last night said the wind sounded like a gigantic locomotive with square wheels roaring through at a 100mph. days as Harvey and its circulation remains off to our west. “Harvey is expected to move about 100 miles in the next 5 days—a speed of less than 1mph. In a few years or so, that sort of quote may involve months not years as these events become commonplace. Ugh. Tweets from NWS Houston from the past two hours. “Never Drive or Walk into Flood Waters – Turn Around Don’t Drown! “Ten critically ill babies in Corpus Christi were taken to a hospital in North Texas ahead of the storm, the Cook Children’s Hospital in Fort Worth said in a statement. Cat6 blog has live comments by really great bloggers witnessing serious flooding problems in Houston.Ie one blogger trying to advise others who are frightened as their house floods..Both of you need to have power tools or an axe, or chainsaw in the attic in case you have to get through your roof. Put all your valuables in ziploc bags and up on higher ground. Do this while you still have time. This is serious, please be prepared, it could save your life. I-10 east at mccarty. what a mess. Gotta be hundreds of cars just parked. Yea, they are stuck there and the water will keep rising. It appears. They are in their cars and news man said they will probably spend night there. Boy I hope water don’t rise there. Just an awful…awful night for so many in Houston and it’s surrounding area…and I fear it is only going to get worse…. Immediate, massive introduction of Nat.Guard troops and copters to ferry people off the highway and roofs. Fnck the Tweets; send in the troops where they’re actually needed, not Afghanistan. This appears to be a local Houston weather site. It’s insane what is going on in Houston. “At some point, this must end. But it does not appear likely to do so anytime soon. It is not clear to me whether the homes flooded by Harvey in the greater Houston area will tally in the thousands, tens of thousands, or hundreds of thousands, but it will be many. This community will have to come together after another devastating flood that seems likely to approach the same magnitude as that of our previous reference event, Tropical Storm Allison. That is two historic floods in less than two decades. – You can’t rebuild. This is going to keep on happening with Climate Change, and it will just get worse. Relocate inland. Be safe. – Shut up already with the global warming crap. – It’s you idiots who need to shut up. – This is not the time for this. People are dealing with enough right now. Wait for a better time to spew your “happy ” thoughts. – go hug a gator you left wing twinkies that believe this crap. so no hurricanes in 12 years was climate change? – it has nothing to do with climate change…Y’all keep babbling even though there is no proof. Temps in the last 18 years have not risen. Show me data, proof instead of emotional knee jerk repition of what someone else has told you to try to manipulate you. A storm is not proof…thats called weather. Where’s the data? – We haven’t had a major hurricane in Houston since 2008. Get over yourselves and your idiotic rhetoric about climate change. – God is in control of the weather and these msy be signs that as a people we need to turn back to him. Climatr change is a hoax. Always has been. – Everyone arguing on this needs to stop. – Tell the geoengineers to stop trying to control the weather and it will return to normal….eventually. Not only are they causing the problems, they are polluting our air. – Don’t be daft. Look at the trends for thousands of years and you see we’re actually in a cooling trend, not warming. – Yes shut up, this happened when Claudette came thru, we didn’t blame it on global warming. It is all the concrete from the growing cities! There is no place for the water to go, except into structures. NO ONE planned for the water. – So true…. Climate can ONLY affect so much. If someone wants to argue this, please do so ONLY after you complete the following experiment: take a foldable table and stand it up in a garden tub, small pool, or something that holds water. (This represents land and roads) Put a garden hose on top and turn in on. Start stacking bricks and/ or concrete blocks on top the table. (This represents buildings – houses and skyscrapers). After EACH layer is complete, add an extra hose that is turned on. (This represents extra water sources – bayous, sewage, ditches, etc. ) The weight will eventually buckle the table and everything will be wet and covered in water. If you you use your science and math skills, you’ll realize the land WILL sink. There are limited areas for water to go. – You’ll find out, denier. – Leslie, these fools will never shut up. Let’s just sell them oceanside properties and let nature take its course. Obviously the comments favour denial, at least today. Wake up call? Now not even sure it will be one there locally much less nationally. There are clear climate change influences that impacted Harvey. Will post a complete assessment following the event. Likely later this week. The quality of the comments (or lack thereof) are unsurprising. Merchant of doubting going on as usual. It’s worth noting that a majority of the public agrees with the scientists. So these comments are not fully representative. Perhaps they are representative of the views of those living in Texas (or other major fossil fuel producing regions). Although the public consensus is closer to 55 percent while the scientific consensus is higher than 97 percent. I wonder how many commenters are part of the quick dispatch squad paid for by some PR agency. The city’s washing away and they’re arguing about whether it’s happening. Texas, all right. Yeah. That relaxing of the flood standards just prior to what may well be the worst flood in U.S. history was a great job. So was using the hurricane as cover for a presidential pardon of someone who spent 20 years setting up a concentration camp along the U.S. border. From an interview with John le Carré and Ben Macintyre in today’s NYT Book Review. B.M. And today you get this wonderful Russian lawyer woman [Natalia Veselnitskaya, who was in the pre-election meeting at Trump Tower with Donald Trump Jr.] who is straight out of one of our books, a character that is possibly connected to the Russian state. Who knows? They exist somewhere in that foggy, deniable hinterland. It’s called maskirovka — little masquerade — where you create so much confusion and uncertainty and mystery that no one knows what the truth is. Treason. That’s the ticket and it ought to be punched before anyone else is charged so he’s unable to pull any more bogus pardons when others -friends and family – are charged. Do you have any take on the ongoing investigation? Seems those folks would love to nail him and rightly so. Seems they’re taking time to have an undeniable, tightknit case before pulling the trigger. This is going to be a ‘natural’ disaster that the United States has not seen, even after Katrina and Sandy. 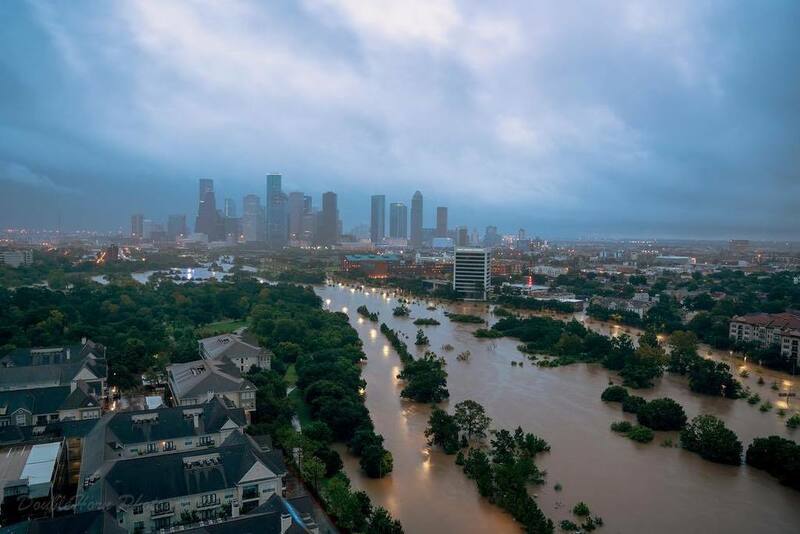 There are 5.2 million unevacuated residents in Houston alone. A couple of abbv. tweets do not cut it. Preparedness was ignored from the top; proactive involvement three daze ago would’ve made a huge difference on the lives of those now under threat and worse. At the bottom of that it says “people fleeing to attics”. This is going to get really bad with fatalities if that is the case and the water keeps rising. I was reading that the worst case estimates are being bypassed with what is occurring. A study published this week in Proceedings of the National Academy of Sciences showed that among the most educated, there’s actually a deep divide in beliefs about controversial scientific issues. The researchers analyzed public opinions on six topics—stem cell research, the big bang, human evolution, climate change, nanotechnology, and genetically modified foods—based on more than 6,500 responses from the General Social Survey (a national survey conducted once every two years.) Overall, they found that education level was “at best weakly related” to acceptance of the scientific consensus. A bit misleading (probably unintentionally). Among climate scientists, there’s practically no divide on basic causes. What this study shows is that generally more educated people tend to dig their heels in more and attempt to use data to support their views than others. In other words, it’s confirmation bias writ large. But from the point of view of climate change itself , the various facts weigh in overwelming favor of an outstanding pile of scientific evidence supporting the fact that climate change is human-caused and that the consensus science is mostly right on the subject. There are a few outlier issues that the consensus science has some difficulty tracking. But any study of anything weather and climate related is going to have trouble nailing down the most extreme outcomes which inevitably have high levels of uncertainty involved. 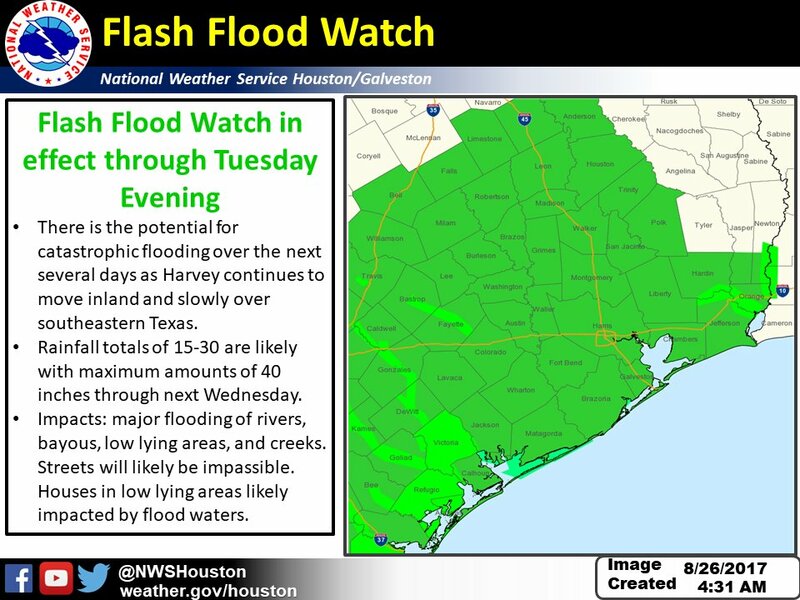 “There is “extraordinarily dangerous flooding” in southeast Houston, according to Jeff Lindner with the Harris County Flood Control District. Emergency officials warn that people should NOT go into their attics, but instead go to the roof. They also say if 911 doesn’t answer immediately, it is important to stay on the line. “Virtually every watershed in this county, minus the extreme east side, is facing very significant flooding right now,” Lindner said. Thank goodness they are making this announcement. Better to be stuck out in the rain than trapped in the attic and drowning. Climb out don’t drown. Some models are now showing this storm moving back out into the gulf, then swinging back into Houston. Nothing to prevent that happening, I guess. It’s a matter of probabilities. But the huge reservoir of heat in the waters of the Gulf of Mexico makes such scenarios much more likely, it seems. The coverage of the Weather Channel is good, but nobody is saying “global warming”. It’s a teachable moment, and the Weather Channel that is a commercial operation relying on advertising is apparently afraid of offending the Trump supporters and climate science deniers. But, the message is getting through to most people, anyway, I think. Lack of high level wind shear is allowing the system to hover and stay somewhat organized. Is a lack of high level wind shear related to global warming? Dunno. What would Jennifer Francis say about this, I wonder? Is this flooding event possibly connected to the general slowdown of jet stream planetary waves? I wonder what the experts like Michael Mann and Jennifer Francis are saying about Harvey? Leland, my understanding is that, no, GW actually corresponds to higher windshear more often. That’s why they do not expect there to be more _frequent_ hurricanes, even though there will otherwise be more conducive conditions for their formation. But when the wind shear happens not to show up to cut them apart, we are more likely to see the hurricanes that do develop turn into these kinds of monsters. That’s my understanding anyway. Others can correct and or supplement if so inclined. It’s generally unclear. At 1-2 C there does appear to be generally more shear. But long periods of atmospheric stagnation and regions of very low shear can also tend to emerge. As well as jet stream slowdown and stalling, there is also a lot of just breaking up and splitting of the jets. I I don’t know how that aspect could be measured, but it would seem to add more uncertainty to predictions based on a predominately intact, but slower jet. Nightmare scenario if it emerges. Stupid question: one of the models that shows this thing going back out to sea indicates that central pressure will dip below 1000 mbs again. Is that part of a definition of a hurricane, or is it just windspeed that counts. Couldn’t find much on this with a cursory search. The two primary measures of intensity for hurricanes are wind speed and barometric pressure. Barometric pressure is a measure of the overall strength of the system, regardless of wind speed. Smaller storms with higher pressures can have higher wind speeds. Larger storms with relatively lower pressures can have somewhat lower wind speeds. For example, you could have a very large 935 mb storm that’s a minimum category 4 when it comes to winds speed (130 mph) but that has more energy overall than a much smaller 940 mb storm that has winds approaching Category 5 intensity (155 mph). Wind speed itself is what determines category. However, barometric pressure generally determines overall energy in the system. If Harvey stays near the coast, it’s unlikely to reform into a Hurricane. Usually pressure has to fall to around 970 to 980 mb for that to happen. Gradient is the primary driver. Temperature was forecast here in Cottage Grove, OR to get close to 100F today but smoke from the wildfires is so thick we will probably not get over 85F. What a devil’s bargain. Roast in the heat or feel the burn in your lungs. The floods in Texas are quick and devastating. Wiping out people and property. The drought here is slower and more insidious, year after year gradually turning the land into a strange type of desert where we get heavy rain for about 3 months and then high temps and zilch rain for months on end. Human induced climate change? Oh yeah. No doubt about it!